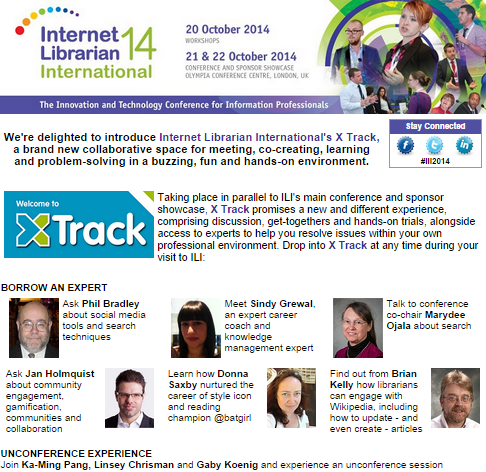 ILI, the Internet Librarian International conference, is my favourite library conference. I’ve attended (and indeed spoken at) all but one of the conferences since it was launched in 2000. In recent years I’ve also shared my thoughts on aspects of the conference on this blog including posts since 2011 on Twitter Archives for the #ILI2013 Conference, ILI 2013: The Future Technologies and Their Applications Workshop, Sharing (or Over-Sharing?) 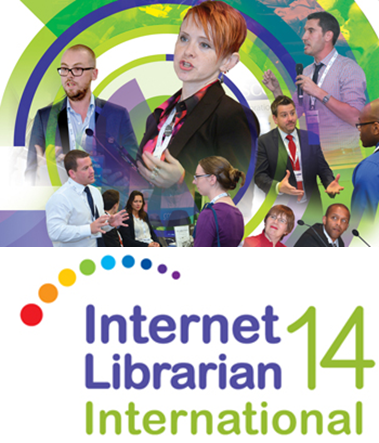 at #ILI2012, “Making Sense of the Future” – A Talk at #ILI2012, What Twitter Told Us About ILI 2011, Learning Analytics and New Scholarship: Now on the Technology Horizon and ILI 2011 and the ‘New Normal’. I should also add that for several years I have been on the ILI advisory group. 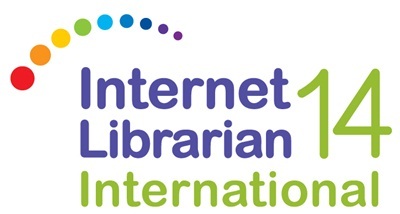 I am also one of the ILI blog supporters. ILI 2014 will take place at the Olympia Conference Centre, London 21-22 October 2014 with a series of pre-conference workshops taking place on 20 October. The theme this year is “Positive Change: Creating Real Impact“. I intend to submit a proposal related to my work as Innovation Advocate at Cetis, possibly on my work with Wikipedia or perhaps on the implications of technological developments for librarians. But when I noticed the invitations for panel sessions I wondered whether a panel session might provide a useful mechanism for airing a diverse range of views. Back in 2005 I gave a talk on Folksonomies – The Sceptics View in a panel session on “Folksonomies: Community Metadata?” which provided an opportunity to raise concerns about the possible pitfalls and limitations of folksonomies. When I took part in the Hyperlinked Library MOOC last year I felt there was an uncritical acceptance of the role of social networks in a library context. I therefore wrote a series of blog post which challenged the consensus positive view on the library of the future: The library of the future (part 1): a privatised future; The library of the future (part 2): services for the self-motivated middle classes? ; The library of the future (part 3): because we’re right! ; The library of the future (part 4): a dystopian future? and The library of the future (part 5): everyone’s a librarian!. 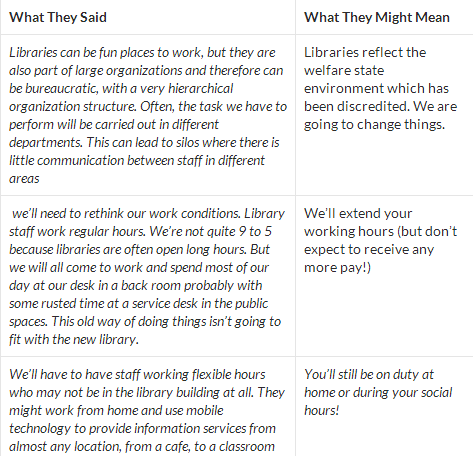 As described in the initial post on The library of the future (part 1): a privatised future a YouTube video used in the MOOC entitled “Library of the Future in Plain English” could be interpretted as a right-wing vision of the future of libraries, with a significant deterioration in the pay and working conditions for librarians (see the accompanying table which was included in the blog post). The video clip employs much of the kind of language we have come to expect. As always, it paints things in a way that, on the surface at least, seems agreeable and non-controversial. Of course, once you read between the lines it is clear that it is not necessarily a benign vision. Would anybody be interested in taking part in a panel session which sought to explore the diverse visions of the future of the library in an Internet environment? If so, feel free to get in touch.